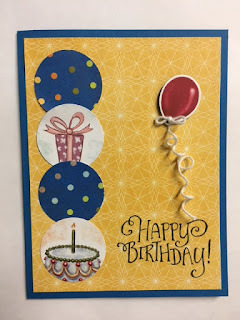 I was asked about the measurements of the circles in a card I created back in November of 2015. I hadn't included the size punch I used so I emailed my reader back and told her I would make a new updated card in a few days. As I thought about what card I was going to make today I thought I would go ahead and make that updated card. So here is what I came up with! You can see the card in question here. I used the "Birthday Delivery" bundle to stamp the words. I had used black Memento ink on them. I also used the balloon framelit for the balloon. I die cut it from the "Birthday Memories" Decorative Series Paper (DSP). The base of the card is a folded half-sheet of Pacific Point. The layer on top is a piece of the DSP from the "Birthday Memories" pack. I also punched out the circles from the DSP. I used a 1-3/8" circle punch to do that. I taped them in place, one slightly on top of the other. I recommend you lay them out first to make sure the bottom and the top circle are about the same distance from the DSP edges. Now for the balloon. I had tried to tie a knot around it but it didn't want to stay. So I punched a tiny hole in it, about 1/16". I threaded the Baker's Twine from the back to the front. I tied a bow and then held the thread tight around the punched opening and threaded the end back through. I cut the end, leaving about 3/4". I taped that 3/4" to the back of the balloon with clear scotch tape. Then I held the twine firmly and used my scissors (closed scissors) and pulled the thread between the edge of the scissors and my thumb, like you would with curling ribbon, and I gave the thread a curl. I did have to do mine twice because I didn't like the first curl, it wasn't curly enough. But if you do it too many times it won't curl at all. I set the balloon in place using Dimensionals. Then I trimmed the end of the twine and the card was done! This was quick and fun to make and I do like the balloon in the corner!